MELVILLE, N.Y., April 13, 2016 – Canon U.S.A., Inc., a leader in digital imaging solutions, is proud to announce today the new Compact-Servo 18-80mm Zoom Lens (model name CN-E18-80mm T4.4L IS KAS S), a compact and lightweight 4K-ready lens constructed for optimal mobility. A bridge between traditional Canon EF photography lenses and CN-E cinema lenses, the COMPACT-SERVO 18-80mm can be ideal for filmmakers and documentary shooters who want the control and quality of cinema optics with the lightweight, compact design and features of photography lenses. 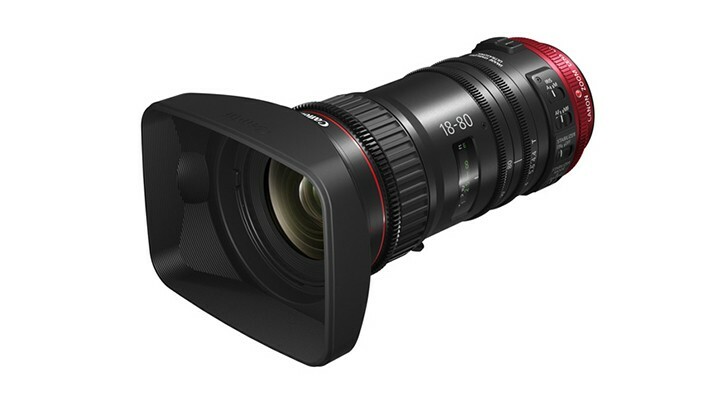 The first in a new class of Canon lenses, the COMPACT-SERVO 18-80mm Zoom Lens is a cinema-style lens that includes a newly developed servo drive unit as a standard feature. Additionally, the lens incorporates Image Stabilization* and Autofocus* functionality, two extremely useful features not commonly found in cinema lenses, but which are ubiquitous in photography lenses. The lens also provides high image quality that supports 4K image productions and was designed to be able to be utilized in a variety of shooting styles including, hand-held, shoulder mounted, and tripod mounted. Covering the commonly used focal length range of 18mm to 80mm, this new Zoom Lens combines the functionality of Canon EF lenses with the precision and cinematic look of Canon Cinema lenses. The new COMPACT-SERVO 18-80mm Zoom Lens is 4K-ready and features auto focus and optical image stabilization with compatible camera models only, resulting in high-resolution imagery, with the ability to assist filmmakers in capturing the shot they envisioned. Compatible with EF- mount Super 35mm large-format cameras, the lens maintains brightness across the entire focal range at T4.4 (equal to F4.0). For added convenience, videographers can control many of the features of the lens in a variety of ways through the EF-mount communication, including Dual Pixel CMOS AF, push auto iris, record start and stop and remote lens control via the camera with an optional remote control, compensation for chromatic aberration (when paired with the EOS C300 Mark II Cinema Camera), metadata acquisition, and selection of T-number display. The COMPACT-SERVO 18-80mm Zoom Lens features a nine-blade iris aperture diaphragm to help give footage a truly artistic and beautiful look and feel, providing the much desired “bokeh” effect in the out-of-focus areas. For improved operability, focus breathing has been greatly reduced due to the three group inner focusing system. The lens comes equipped with a newly developed Servo Drive Unit, which provides seamless switching between servo and manual modes, allowing videographers motorized control of focus, zoom, and iris settings. The Servo Drive Unit is compatible with broadcast style industry-standard lens controllers including Canon’s ZSD-300D or FPD-400D. To further enhance ease-of-use for ENG and “run-and-gun” style shooters, Canon has developed an optional grip accessory specifically designed for the new lens, the ZSG-C10. The grip accessory connects to the camera through a 20-pin cable, allowing a variety of lens functions to be controlled from the grip, including zooming via a zoom rocker switch, one-shot AF and the starting and stopping of a recording. When the lens and grip are being used with the EOS C100 Mark II or EOS C300 Mark II Cinema Cameras, users will also have the ability to control the zoom and iris from the camera’s grip unit. The Canon COMPACT-SERVO 18-80mm Zoom Lens and ZSG-C10 accessory grip are scheduled to be available later in 2016 for an estimated retail price of $5,500 and $499 respectively. ** Additional lenses in the COMPACT-SERVO lens class will be announced in the near future.